"Remember your leaders who taught you the word of God. Think of all the good that has come from their lives, and follow the example of their faith.” (Hebrews 13:7, New Living Translation). 20th March 2010 was very special to me. Tears filled my eyes as I saw all the Baptist associations in Zambia represented at the launch of the Zambia Baptist Historical Society. Many said that it was the first time in the history of Zambia for all the Baptist associations to come together in this way. The enthusiasm in the air was unquestionable. Baptists in Zambia want their history to be recorded and maintained for the sake of posterity. That was the clear testimony from the events of the day. How did all this come about? 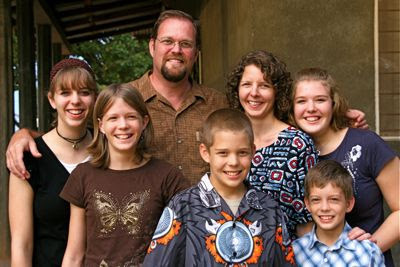 It all started with the centenary of Baptist work in Zambia in 2005. Missionaries Henry Masters and Arthur Williams (seen here with his wife many years later) arrived in Zambia to establish the first Baptist mission in Kafulafuta in 1905. I was in South Africa in 2004 doing my first Masters’ degree when the General Secretary of the Baptist Union of South Africa (BUSA), Rev Angelo Scheepers, told me that they were gearing themselves to join the Zambian Baptists in their centenary celebrations the following year. Since Kabwata Baptist Church was not in any formal association at that time, I thought that explained my failure to know about this. I assumed that the news of such celebrations were commonplace among the churches that were in formal associations. I also assumed that someone was working on a book on Baptist history in Zambia. 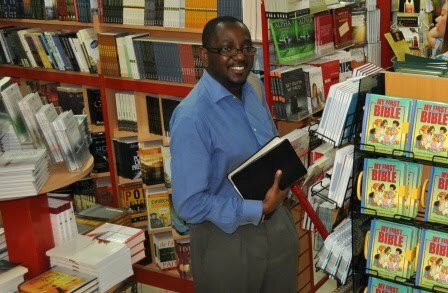 As the year 2005 commenced I asked around and it became apparent to me that no book on Baptist history in Zambia was coming off the press. 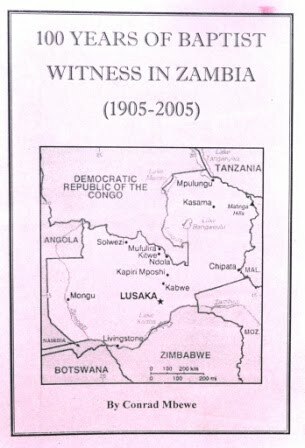 The closest was a small book that was written in South Africa by Dr Kevin Roy, a South African Baptist historian, which talked about the South Africa Baptist Missionary Society’s (SABMS) involvement in establishing the Baptist witness in Zambia. I decided if no one was going to do it then I would take this project upon myself. 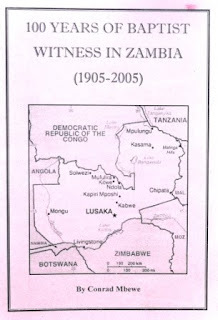 So, by the middle of the year 2005, I had written a forty paged booklet of the history of Baptists in Zambia. I presented this material at a special meeting hosted by Kabwata Baptist Church at the University of Zambia Christian Centre to mark the hundredth anniversary of Baptist work in Zambia. Later, I learnt that a much bigger meeting had been held at Kafulafuta Mission. It was humbling to know that the organizers of this event did not think that I was significant enough to be told about it! 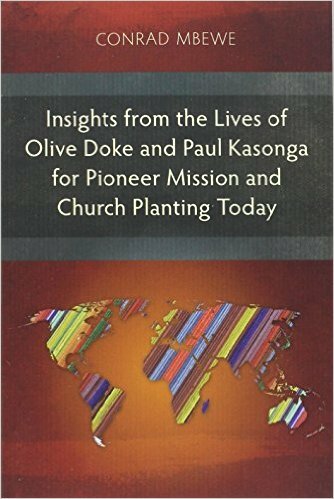 As I was working on my second Masters degree, I decided to do research on how much Baptists in Zambia knew about their own history. I did a questionnaire and distributed it among all the Baptist associations in the country to sample their knowledge. 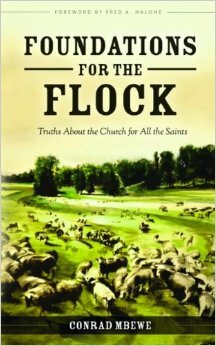 I found that the first fifty years were almost totally unknown and then in the more recent fifty years people only knew what was happening in their own small circle of churches. Clearly, something needed to be done to change this. During this research I travelled to Kafulafuta Mission for the first time and found the first Baptist church building in a sad state of disrepair. 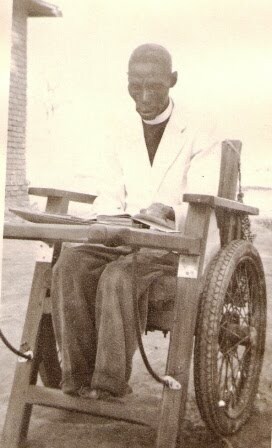 I asked to be shown the grave of the first indigenous Baptist leader, Paul Kasonga (seen here reading his Bible a few days before he died). I was told that it was not possible to reach the grave at that time of the year. After I persisted, I was taken there. What an experience that was as we made our way through elephant grass that was taller than us. At some point I waited while my guide, Rev Lydon Pensulo, looked around in the grass until he finally called out, “I have found the grave. Come!” (see photo below). What I found there broke my heart (see photo below after we cleared the grass away from the grave). 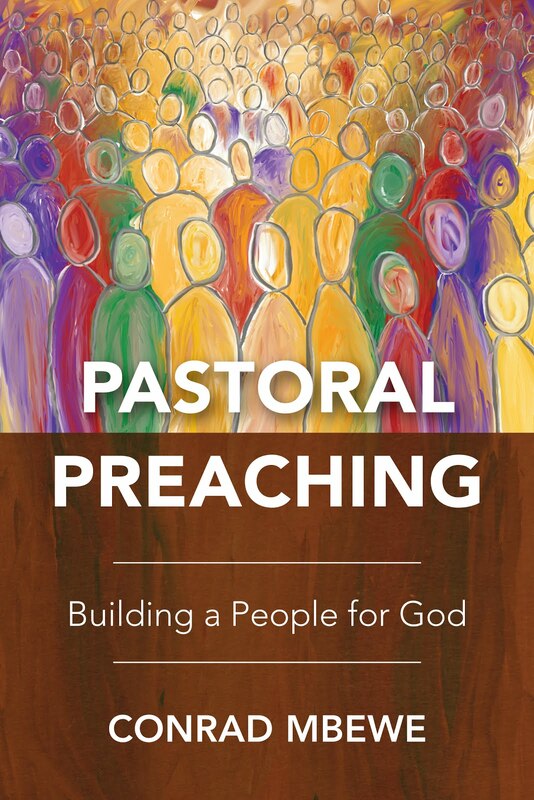 I thought, “How can we Baptists today be driving around in our 4x4s when the grave of our spiritual forebear lies in this state?” If I was a Charismatic I was going to say that it was God who spoke to me in an audible voice. Or if I was still steeped in African traditional religions I was going to say it was Paul Kasonga’s spirit that spoke to me. But I know that it was my conscience that smote me! I returned to Lusaka and showed the photos of what I had found in Kafulafuta at the next inter-church elders’ meeting of the English-speaking Reformed Baptist churches in Lusaka. The whole place was silent when they saw the pictures. You could have heard a pin drop! The sad faces told me that the message had clearly registered on the consciences of all those who were present. One by one the elders said that we needed to do something about this. Paul Mumba (an elder at Lusaka Baptist Church), Charles Chilemu (an elder at Evangel Baptist Church), and myself, were tasked to provide leadership to the whole process of preserving Baptist heritage, especially at Kafulafuta. 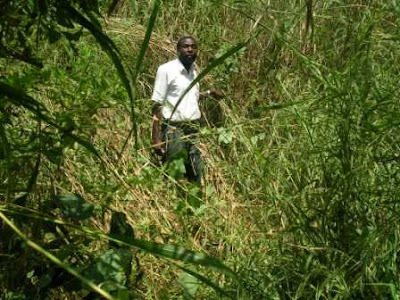 Kabwata Baptist Church dispatched a team, under the leadership of Logan Nyasulu, to go to Kafulafuta and survey the extent of the challenge on our hands. They did so and brought back a report with recommendations on how to register and maintain a heritage site. The Reformed Baptist Radio and Television Ministry turned my book (see photo of booklet) into a thirteen weeks radio series which was aired on national radio in 2007. We had hoped to also do a series on television and in the Post newspaper, but these two projects never took off. Thankfully, many people, especially those in Lambaland where Baptist work commenced, listened to the radio programme and started enquiring about how to preserve this history, naming individuals who had extra information. Finally, it became evident that there were three things we needed to do. (1) Form a Zambia Baptist Historical Society and use this to bring all the Baptists interested in preserving our rich heritage to work together in this noble task. (2) Find a suitable site to maintain a Baptist Archives, where all Baptists would be encouraged to send their documents of historical significance. 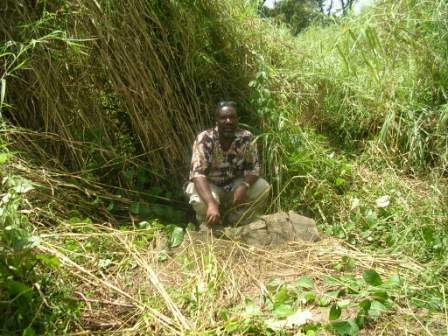 (3) Persuade the Northern Baptist Association to set apart the Kafulafuta Mission as a heritage site. 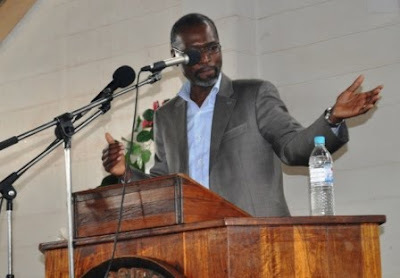 We asked the Baptist Theological Seminary in Lusaka, under the Baptist Fellowship of Zambia, if they could host the Baptist Archives and they readily consented. That was done! 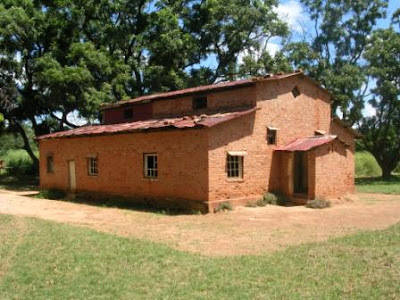 However, it was to take about two years to get ALL the Baptist associations in Zambia to endorse the Zambia Baptist Historical Society and for the Northern Baptist Association to set apart the Kafulafuta Mission as a heritage site for all Baptists in Zambia (below is the old and battered first Baptist church building as it stands today at Kafulafuta Mission). A few years ago they had almost lost the site to an American Baptist group and only managed to win the battle when the High Court ruled in their favour. So, we understood why they had to be very careful this time. They say, “Once bitten, twice shy”. Thankfully, by the end of last year, we had secured all the endorsements we needed and the Northern Baptist Association had consented to making Kafulafuta Mission a heritage site for all Baptists in Zambia. All that was now left was the launch of the Baptist Historical Society. The Lusaka English-speaking Reformed Baptist churches agreed to financially sponsor the launch and the Baptist Theological Seminary agreed to host it. We met with representatives of all the Baptist associations in Zambia early this year and agreed on Saturday, 20th March 2010, as the day for the launch. A working team was put together with representatives of each association so that none was left behind. (We later discovered that we had forgotten about the Mpongwe Baptist Association and we apologized to them. They were forgiving enough and sent a representative for the launch. Phew!!!). 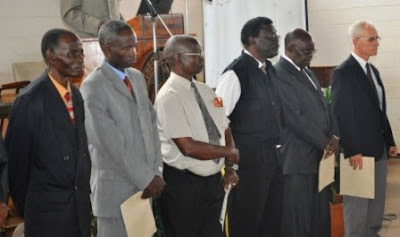 We asked each association to nominate two indigenous leaders to whom the Society would give a Certificate of Appreciation for their distinguished service among Baptists in Zambia during the launch (seen below as the certificates were being given out). In the final week leading up to the launch, as if the Lord wanted us to know that he was aware of our plans, we were made aware of the presence of Pastor Joe Kapolyo (former pastor of Ndola Baptist Church and former chairman of the Zambia Baptist Association, and now pastor of Edmonton Baptist Church in England) who was visiting Zambia. We knew that with his profile he would make a perfect preacher for the day—all the way from England! When we discovered that he was in fact free on the day of the launch, we asked him to preach and he graciously accepted the invitation (see photo). So, when 20th March finally dawned and Baptists of all shades and colours in their hundreds came streaming in from various parts of Zambia, I felt like saying with old Simeon, “Lord, now you are letting your servant depart in peace… for my eyes have seen your salvation.” The programme of the launch was quite simple. Apart from the praying and singing, I did a short powerpoint presentation of the first one hundred years of Baptist History in Zambia. Rev Lydon Pensulo spoke on behalf of all the Baptist associations to show enthusiastic support for the Society. The awards were given to the deserving indigenous Baptist leaders. Pastor Joe Kapolyo preached. 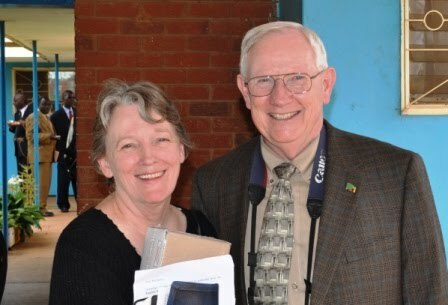 Rev Franklin Kilpatrick (seen below with his wife, Paula, and arguably the longest serving Baptist missionary in Zambia), encouraged us all to pay the price in order to preserve our history as Baptists. The launch involved an initial paid membership drive, and many of those who were present signed up as charter members, with quite a number joining as life members. We ended the event with snacks which we ate together before we dispersed. So, believe it or not, the Zambia Baptist Historical Society has finally been launched! The challenge is now for us to hit the iron while it is still hot. We need to “remember [our] leaders who taught [us] the word of God. [We need to] think of all the good that has come from their lives, and follow the example of their faith.” This will necessitate commencing a Baptist historical journal which will be circulated in all our churches. It will also necessitate the encouraging of research in Baptist history in Zambia, especially by those who are doing theological training. The Historical Society should also encourage churches to include brief Baptist historical or biographical sketches when they are having conferences. We also need to start beefing up our Baptist Archives. All this will demand a lot of effort and finances. Pray for us as we begin this long but rewarding journey. We have a dream. As Reformed Baptist churches in Zambia grow, a number of our churches have sensed a pull—we believe it is a divine pull—to start a university in Lusaka. God seems to have brought just the right team together in order to realise this dream. Leading this team is Dr Ken Turnbull, an Adjunct Professor of Chemistry at the University of Arkansas. The rest of the team can be seen here. To see the architectural drawings of this university campus, click here. Ken recently sent me a write up concerning the vision of this university and I attach it below. I thought of sharing it with you on this blog. Let me warn you, it is not easy reading. What else did you expect from a Professor of Chemistry (even when he is standing with his family smiling at you)?! History clearly tracks the medieval birth of higher education based on a relationship through Christ to God as the only route to truth and real knowledge followed by the eventual victorious grip of Satan's strongholds to displace God's foundation for knowing truth with man's Fallen intellect and reason. For example, the oldest university in America, Harvard College (University) was founded by the Puritans, it's first President being Henry Dunster (1640), a Puritan turned Baptist. The motto of the college was "Veritas Christo et Ecclesiae" ("Truth for Christ and the Church"-1692). Of course, only "Veritas" remains in Harvard's motto today - truth, but with no absolutes for its basis. Western higher education institutes, sadly even the majority of Christian institutes, succumb to the world's standards at the expense of upholding the full truth and knowledge in God's Word through the power of the Gospel. Such abominations support the belief that God is shifting the glory of His church from the West to Africa and the East (see Mark Knoll's book for example). Working with the nearly 40-strong Reformed Baptist churches of Zambia (RBCZ, such as Kabwata Baptist Church), whom God has been maturing for over 20 years as His torch-bearer on the African continent, we believe ACU can reform education to its original base, centred on Christ—the only foundation upon which truth and knowledge can be understood and utilized for man's benefit. 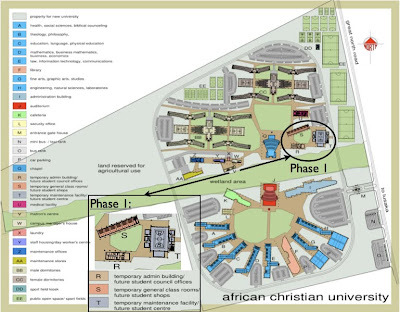 ACU seeks not only to reform education on Christ, but we trust God to develop a uniquely indigenous, whole-life transforming, mentor-based education that will direct the unregenerate to Christ the Saviour, mature them in a Bible-authoritative passion and equip them with biblical discernment to grow in the knowledge of God through a breadth of academic disciplines and technical vocational training. Such graduates can serve the church and uniquely exhibit God's love through benevolent deeds as servants in all professions and trades, exalting Christ's Name throughout African society and transform the continent with global impact. The secular humanist in the West has exalted the standard of knowledge to exclude the Creator based upon the power of human reason and intellect with faith in completely unsubstantiated, evolutionary fantasies, preferring to constrain knowledge and creativity within the prison of "irreverent babble and contradictions of what is falsely called knowledge” (1 Tim 6:20). It is clearly seen that the standards of Western higher education have shaped the foundations of African higher education, even in reforming the African worldview. However, now, through the RBCZ the time has come to see God raising up His scepter to call out His people who will glorify His Name across Africa. Jesus told Nicodemus, "as Moses lifted up the serpent in the wilderness, so must the Son of Man be lifted up, that whoever believes in Him may have eternal life (Jon 3:14-15)." We believe the time and place for developing ACU has been ordained to counteract the secular humanist, postmodern influence growing in Africa. We trust God's work will be accomplished in His time to demonstrate the superiority of an indigenous African, Christ-exalting education for developing professional and technical servants who can combat corruption, develop innovative solutions to Africa's poverty-burdened plight and lead as servants applying God's knowledge through the Gospel rather than continuing to spiral down the degrading path following Western, humanist aid and direction. Initial preparatory courses taught in small mentoring groups, in the process of preparing students for university entrance exams in reading, writing and mathematics, teach through the "creation-fall-redemption-consummation in Christ" cycle, laying a complete foundation for a full understanding of man's hopelessness in sin to death and free gift of faith in Christ to salvation for re-creation and eternal life in Christ. Based on Hebrews 5:13-14, ACU's goal is to bring those regenerated in Christ back through the full exposure to God's Word, followed by further developing their theological understanding and biblical worldview, with a constant view towards developing their ability to rightly handle the Word to discern the depraved from the divine. This is practiced through studying a full range of cultural, worldview, classical, historical and contemporary reading and studies across academic disciplines as opportunities to exercise the tools of biblical discernment, while fully developing grammar, logic, and rhetoric trivium. ACU is developed on the concept that theory without application only effects the intellect (resulting in pride), not the heart (leading to humility in Christ). Therefore, the campus is to become as self-sufficient as possible through integration of practical works, or "intelligent labor," where students are being discipled, applying the principles of God's Word and the things being covered in coursework through work-study opportunities in developing outreach opportunities, church-assisted ministries, industry, research projects, social and governing organisations and a self-sustaining campus environment while learning various trades, industrial arts, ministry and technical skills. Advancing into specific disciplines for BSc/BA degrees or specific trades for certification continue to emphasise biblical discernment in the field of specialisation through a mentor-based approach utilising both on-site and off-site (including international) mentors (PhD's in their field or master craftsmen in their trade). Mentor-directed, self-implemented studies, built on the trivium foundations, culminate in students completing a thesis as an interdisciplinary team formulated to specifically addressing an inherent need or problem in Africa with a workable approach or development. Beyond awarding of BSc/BA degrees and trade certification, further assistance can be offered through ACU's mediation to help turn the best thesis proposals into reality with business, governmental or church assistance as appropriate. The overall goal is preparing African students to apply their Christian faith as servants to their families, churches and communities, uniquely displaying the Gospel through addressing Africa's deepest needs with innovative, benevolent, God-glorifying solutions in response to God's creation and redemption mandate. Are you still there? 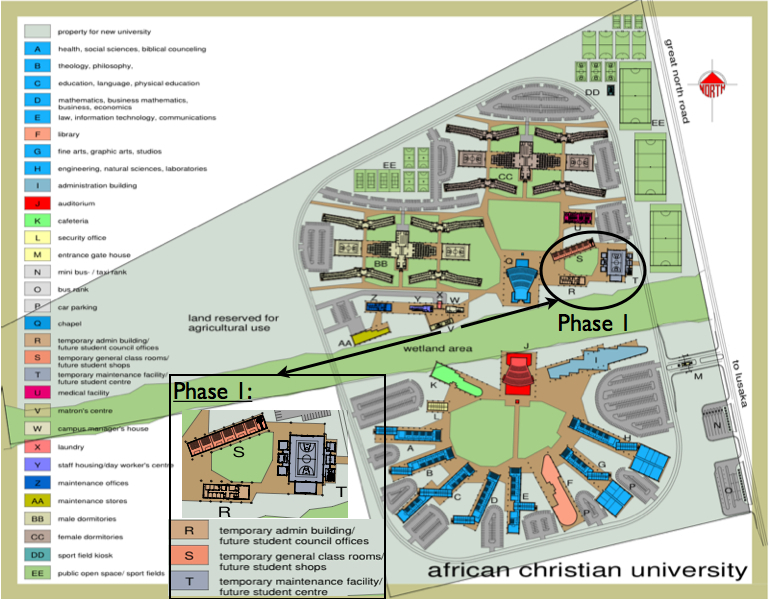 If you are and you want to read more about the African Christian University, please visit the university’s website here. The website under “partners” also deals with how you can support this mammoth project financially. At this stage, we primarily ask for your prayers that this “dream” will soon be realised to the benefit of many on the African soil. Join us in seeing this dream reach fruition. Amen! “As they go through the Valley of Baca they make it a place of springs; the early rain also covers it with pools. They go from strength to strength; each one appears before God in Zion” (Psalm 84:6-7). Matthew Henry, commenting on these verses says, “That they had a good will to the journey. When they were to attend the solemn feasts at Jerusalem, they would not be kept back by bad weather, or bad ways, nor make those an excuse for staying at home. Difficulties in the way of duty are designed to try our resolution; and he that observes the wind shall not sow.” That is what we found in Dubai. We found a family of Christians who did not make living and working in a largely Islamic country an excuse to hide their spiritual light and life. They continue to bear witness to the Saviour, Jesus Christ. Felistas and I went for our first ministry trip to Dubai from Thursday 11th to Sunday 14th March 2010. We knew we were going to “the Shopping Mall of Africa”—if not of the world—because whoever heard that we were going to Dubai immediately asked what we were going to buy. Some even wondered whether we had joined the traders who go there to bring goods for resell in Zambia. Others immediately asked us to buy them various items while there. I mean, why else would anyone go to Dubai? So, not a few were shocked to discover that I was going on a preaching trip. “You mean, there are Christians in Dubai?” Yes, there are! And there are enough Christians to form churches. The United Christian Church of Dubai is a mega church. In fact, this first visit to Dubai was in response to an invitation from the United Christian Church of Dubai (UCCD) for me to handle their annual men’s retreat. The arrival and departure times for this trip on Ethiopian Airways were not the most civilised. We arrived around 03.30 hours and found Richard Ngwisha—a Zambian who is part of the pastoral team of UCCD—waiting for us. By the time we cleared out of the airport it must have been around 05.00 hours in the morning. We could barely keep our eyelids apart! The moment we were shown our bedroom at Richard’s home, we did not waste a second but went straight to sleep until late morning. 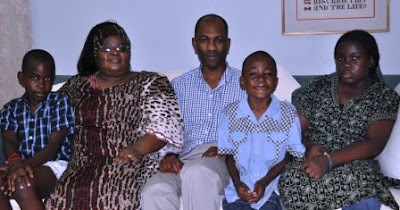 It was good to meet Richard’s wife, Catherine, and their three children (shown above). They must have also been very happy to see us because most of the weight we carried from Zambia to Dubai comprised various Zambian delicacies for their family. Although we had bought some ourselves in preparation for our visit, their friends kept bringing more and more as they heard about our pending departure. So, we were as glad to get rid of the weight as they were to receive it! But, before we leave the subject of Dubai and traders, it is worth mentioning that when we changed flights in Addis Ababa, we immediately sensed that we had bade farewell to civilisation and good manners. The vast majority of the people that were on the flight from Addis to Dubai were clearly traders. There was very little respect for queues and for order. A number of them sat on seats that were not theirs and even immediately went to sleep across four seats. So, the air hostesses had their work cut out for them as they tried to bring sanity to the situation! What struck me the most the moment we set our eyes on Dubai was the amount of infrastructural development that was taking place. To begin with, on every side one was struck by some of the best architectural buildings that one can find anywhere in the world. Then, it was the number of cranes I have never seen so many in my life. I mean, it looked as if every tall building had one on top of it! My first assignment was in the evening on the same day we arrived (i.e. Thursday). It was an informal meeting around a meal with the church leaders and their spouses. I talked about the gospel-centred ministry that we have at Kabwata Baptist Church. Then the church senior pastor, John Folmar, interviewed me briefly before allowing the other church leaders to “grill” me with questions. It was a very relaxing evening and helped to ease me into the work that lay ahead for the weekend. It was good to meet Marc Glass and John from HeartCry Missionary Society in the USA. They are our chief partners in our work of missions in Zambia and had timed their visit to the Middle East to coincide with my visit there. I felt very honoured. The next day was Friday but that was their “Sunday”. It was the day when everyone went to church or to the mosque. It was a rather strange feeling to wake up on Friday morning and see everyone heading out not to work but to their places of worship. The United Christian Church of Dubai has two services and meets in a building where two or three other churches meet. The building also hosts the Bible Society’s bookshop. So, it was quite an experience seeing so many people in one building but going into different churches. 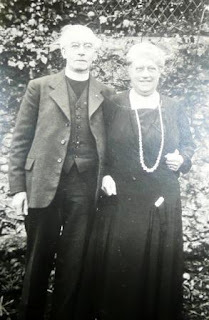 Richard had the unenviable task of introducing me to the congregation in both services. In his introduction, he reminisced about the “good old days” when we used to walk home together after church at Lusaka Baptist Church in the early 1980s. We lived in the same area. He recalled our singing hymns as we walked together and how we meditated on the hymns and the sermons we had been listening to. I was impressed by how much he was able to remember. One pleasant surprise that day was meeting Martin Mweemba (seen above in the Bible Society bookstore), whom some former United Church of Zambia (UCZ) youths who are now in our Reformed Baptist ranks will recall. His wife is Isabelle. I officiated at his wedding some twenty years ago. He was now working in the United Arab Emirates. We spent the next day and a half together. What a pleasant surprise it was to meet him. Immediately after the church service, Felistas and Catherine (Richard’s wife) went with the kids back home while we drove off to Al Ain, where the men’s retreat was being held. It was a good 130 kilometres from Dubai. 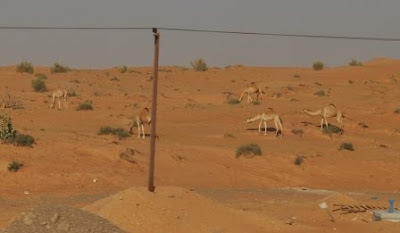 It was interesting to see how the landscape became nothing but desert as soon as we left Dubai. It was a quick reminder that as breathtaking as Dubai might be, it was built on sand. As soon as we arrived in Al Ain and checked into the hotel, I was ushered into the pulpit to begin my five part series of messages on 1 Timothy 3. I used this passage not as a list of qualifications for the office of elder but as a portrait of a mature Christian man. So, in the first session I dealt with the man himself as he stood in relation to his God. In the second session I dealt with the mature Christian man as a “one woman man”. After the second sermon, the men went into discussion groups. I had initially intended to join one of the groups but by the time I finished my second sermon I realised just how tired I was. So, I just sat around waiting for supper. After supper, we retired to our rooms for the night. Saturday began with a brief session (shown above) by John Folmar where he dealt with the need for the men to enter into mutual accountability relationships that would become an informal network of discipleship in the church. It was certainly very appealing and gave me a lot of food for thought. I then handled my third session, in which I dealt with the man and his family. The men then broke off again into discussion groups. When they returned, I handled my fourth session, in which I dealt with the man and his work. This went up to lunch. In the afternoon I handled the fifth session, where I dealt with the man and his church. In each session my burden was to show what biblical discipleship meant in each of those areas. I trust that the men appreciated what they heard. In our last session, I was “grilled” with questions. It was on that note that the retreat ended. 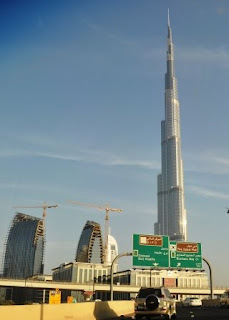 With the retreat behind us, we drove back to Dubai. I was exhausted and so we spent the rest of the evening just relaxing at Richard’s home. By 21 hours, I realised that we were flying out that night and I had not participated in any serious shopping. How do you come to Dubai and not do some serious shopping? It is like going to the North Pole and not touching snow! So, off we went to a section of Dubai that was bustling with traders at that late hour of the night. It was like Kamwala at noon and on pay day for that matter. Richard was very handy. He assured us that the first price offered by the shop owners is not the last. You had to bargain and thus bring the price down. He said that the Nigerian traders were the best at bargaining. They can sit there the whole day until the price of the goods really comes down. Well, we did not have the whole day, and so we left it to Richard to do the bargaining for us—and he did an excellent job. We saw prices slashed down to the barest minimum. It was a fitting close to a brief and spiritually educative visit to “the Shopping Mall of Africa”.